It was merely by chance that I stumbled over a new game this week, I suppose we can call this game ‘Hunt the bantam’. 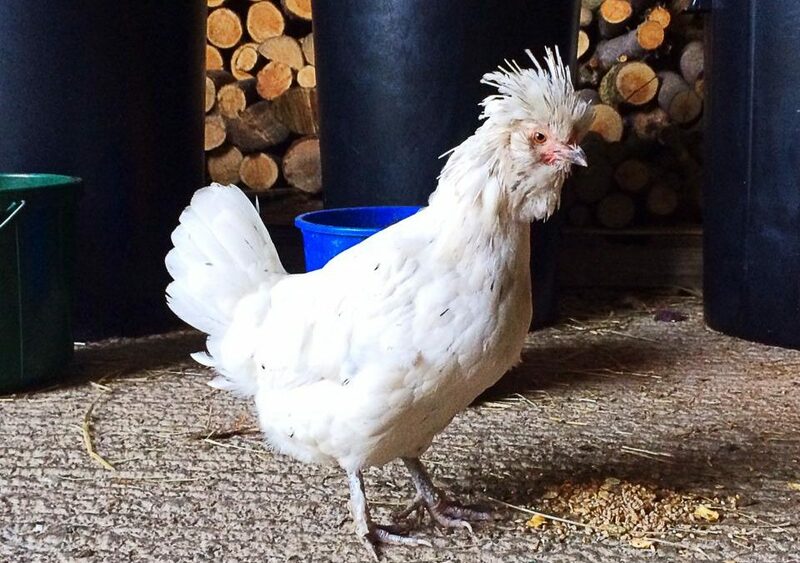 For several nights now I have had a job and a half trying to track down our two wandering chickens.It appeared to me that Layla and Henrietta had been getting on so well since being reunited some weeks ago, but they haven’t been snuggling down together each evening in their lovely home. I’m not sure if they’ve had a row or just fallen out, but I’d like to know why. After setting out, armed with my trusted torch, I hunted far and wide and in all the usual places before eventually tracking them down.Layla has been choosing to roost on the edge of one of our large potted hostas and Henrietta has been perching in the branches of a large magnolia tree. Each evening I have rounded them up and returned them both to their home, for safety more than anything, as there’s always a chance that Mr Fox could come calling. I just hope they sort out their differences and make up soon! The next time he was about to mow past me I gave him a very concerned look and he stopped the mower and said his head wasn’t hurting yet, but he asked would it do much damage. I said, well that depends on whether you are allergic to Robinsons Apple and Blackcurrant squash and fresh orange juice, as that was all that was actually in the wasp catcher. I could see the relief immediately, but he did appear to be a big hit with the local wasps. For weeks I have warbled on about the swallows we have nesting here and have wondered when they will be ready to leave for South Africa. On Saturday morning, even though it did take a while I managed to count 77 of them in flight along the fence line and in our youngest chestnut tree and I’m really glad I did. That’s because, as of sunrise Sunday morning every single one of them had left and not one had said ‘goodbye’. It never ceases to amaze me how people continue to go out of their way to help us. Some weeks ago I mentioned that I was getting fed up of our pigs continually flipping over all of the feed troughs in their pen. Well, a week later a farmer friend got in touch as had received a call from his friend, who had read about my plight in Country Week. He went on to say his friend had asked me to get in touch as he may be able to help me out. I have since got in touch with Frank and indeed he could help, as I pick up new feeders for the pigs today.